Jonathan Thomas is a Senior Lecturer in Microbial Genomics in the School of Science & Technology. 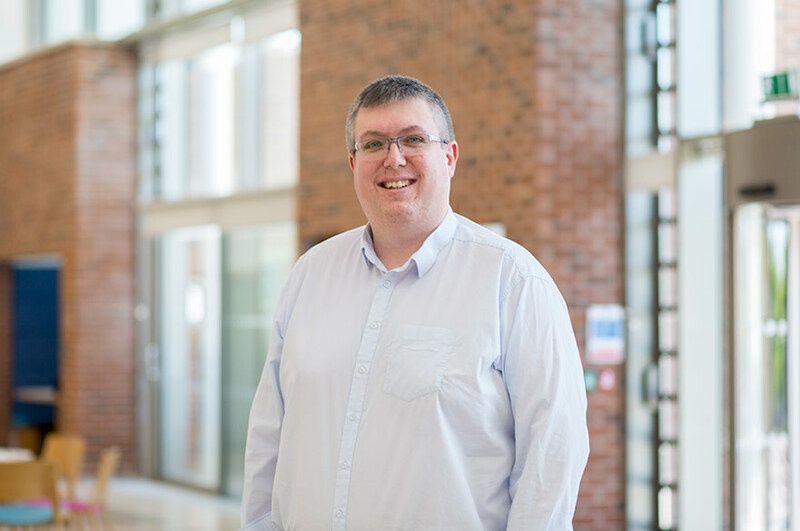 He is module leader for the Forensic Microbiology and Microbial Diagnostic modules, and supervises undergraduate and MSc/MRes projects on staphylococcal population genetics and antimicrobial resistance. Dr Thomas gained his PhD from Imperial College, London, studying the molecular epidemiology of staphylococcal species. On completing his PhD in 2007, he moved to Yale University for three years as a postdoctoral researcher to study virulence factors of Streptococcus pneumoniae in otitis media infections. In 2010, Dr Thomas started his second postdoctoral research position at the University of Mississippi Medical Center. In 2013, Dr Thomas returned to the UK as a lecturer at the University of Bolton, before joining NTU in 2017. Dr Thomas' research involves a combination of wet lab work and bioinformatics, and is primarily sequencing-based. We use a combination of Nanopore and Illumina sequencing technologies to study the population genomics of staphylococci and Streptococcus pneumoniae, with a particular interest in the population structure of coagulase-negative staphylococci and balancing selection in a range of species. Dr Thomas is a member of the Antimicrobial Resistance, Omics and Microbiota research group, which is part of the Centre for Health, Ageing, and Understanding Disease (CHAUD). Opportunities to carry out postgraduate research towards an MPhil / PhD exist in the areas identified above. Further information may be obtained from the NTU Graduate School. Tolo IE, Thomas JC, Fischer RSB, Brown EL, Gray BM, Robinson DA (2016) Do Staphylococcus epidermidis Genetic Clusters Predict Isolation Sources? J Clin Microbiol. 54(7):1711-19. Moon BY, Park JY, Robinson DA, Thomas JC, Park YH, Thornton JA, Seo KS (2016) Mobilization of Genomic Islands of Staphylococcus aureus by Temperate Bacteriophage. PLoS One 11(3):e0151409. Moon BY, Park JY, Hwang SY, Robinson DA, Thomas JC, Fitzgerald JR, Park YH, Seo KS (2015) Phage-Mediated Horizontal Transfer of a Staphylococcus aureus Virulence-Associated Genomic Island. Scientific Reports. 5:9784. Nimmo GR, Steen JA, Monecke S, Ehricht R, Slickers P, Thomas JC, Appleton S, Goering RV, Robinson DA, Coombs GW (2015) ST2249-MRSA-III: A Second Major Recombinant Methicillin-Resistant Staphylococcus aureus Clone Causing Healthcare Infection in the 1970s. Clin Microbiol Infect. 21(5):444-50. Thomas JC, Zhang L, Robinson DA (2014) Differing Lifestyles of Staphylococcus epidermidis as Revealed through Bayesian Clustering of Multilocus Sequence Types. Infect Genet Evol. 22:257-64. Keller LE, Thomas JC, Luo X, Nahm MH, McDaniel LS, Robinson DA (2013) Draft Genome Sequences of Five Multilocus Sequence Types of Nonencapsulated Streptococcus pneumoniae. Genome Announc. 1:e00520-13. Zhang L, Thomas JC, Miragaia M, Chavez F, d’Azevedo PA, de Lencastre H, Gray BM, Robinson DA (2013) Multilocus Sequence Typing and Further Genetic Characterization of the Enigmatic Pathogen, Staphylococcus hominis. PLoS One 8(6):e66496. Zhang L*, Thomas JC*, Didelot X, Robinson DA (2012) Molecular Signatures Identify a Candidate Target of Balancing Selection in an arcD-like Gene of Staphylococcus epidermidis. J Mol Evol. 75(1-2):43-54. Thomas JC, Godfrey PA, Feldgarden M, Robinson DA (2012) Draft Genome Sequences of Staphylococcus aureus Sequence Type 34 (ST34) and ST42 Hybrids. J Bacteriol. 194(10):2740-41. Thomas JC, Godfrey PA, Feldgarden M, Robinson DA (2012) Candidate Targets of Balancing Selection in the Genome of Staphylococcus aureus. Mol Biol Evol. 29(4):1175-86. Thomas JC, Kong Y, Sabharwal V, Pelton SI, Pettigrew MM (2011) Streptococcus pneumoniae Serotype 6C: an Intra- and Inter-clonal Complex Comparison. J Bacteriol. 193(13):3409-10. Thomas JC, Figueira M, Fennie KP, Laufer AS, Kong Y, Pichichero ME, Pelton SI, Pettigrew MM (2011) Streptococcus pneumoniae Clonal Complex 199: Genetic Diversity and Tissue-Specific Virulence. PLoS One 6(4):e18649. Laufer AS, Thomas JC, Figueira M, Gent JF, Pelton SI, Pettigrew MM (2010) Capacity of serotype 19A and 15B/C Streptococcus pneumoniae Isolates for Experimental Otitis Media: Implications for Conjugate Vaccine. Vaccine 28(12):2450-7. Liu C, Graber CJ, Karr M, Diep BA, Basuino L, Schwartz BS, Enright MC, O’ Hanlon SJ, Thomas JC, Perdreau-Remington F, Gordon S, Gunthorpe H, Jacobs R, Jensen P, Leoung G, Rumack JS, Chambers HF (2008) A Population-Based Study of the Incidence and Molecular Epidemiology of Methicillin-Resistant Staphylococcus aureus Disease in San Francisco, 2004-2005. Clin Infect Dis. 46(11):1637-46. Miragaia M, Carriço JA, Thomas JC, Couto I, Enright MC, de Lencastre H (2008) Comparison of Molecular Typing Methods for Characterization of Staphylococcus epidermidis: Proposal for Clone Definition. J Clin Microbiol. 46(1):118-29. Cookson BD, Robinson DA, Monk AB, Murchan S, Deplano A, de Ryck R, Struelens MJ, Scheel C, Fussing V, Salmenlinna S, Vuopio-Varkila J, Cuny C, Witte W, Tassios PT, Legakis NJ, van Leeuwen W, van Belkum A, Vindel A, Garaizer J, Haeggman S, Olsson-Liljequist B, Ransjo U, Muller-Premru M, Hryniewicz W, Rossney A, O’Connell B, Short BD, Thomas J, O’Hanlon S, Enright MC (2007) Evaluation of Molecular Typing Methods in Characterizing a European Collection of Epidemic Methicillin-Resistant Staphylococcus aureus (MRSA) – the HARMONY collection. J Clin Microbiol. 45(6):1830-7. Miragaia M, Thomas JC, Couto I, Enright MC, de Lencastre H (2007) Inferring a Population Structure for S. epidermidis From Multilocus Sequence Typing (MLST) Data. J Bacteriol. 189(6):2540-52. Thomas JC, Vargas MR, Miragaia M, Peacock SJ, Archer GL, Enright MC (2007) Improved Multilocus Sequence Typing Scheme for Staphylococcus epidermidis. J Clin Microbiol. 45(2):616-9. Aires-de-Sousa M, Boye K, de Lencastre H, Deplano A, Enright MC, Etienne J, Friedrich A, Harmsen D, Holmes A, Huijsedens XW, Kearns AM, Mellman A, Meugnier H, Rasheed JK, Spalburg E, Strommenger B, Struelens MJ, Tenover FC, Thomas J, Vogel U, Westh H, Xu J, Witte W (2006) High Interlaboratory Reproducibility of DNA Sequence-based Typing of Bacteria in a Multicenter Study. J Clin Microbiol. 44(2):619-21. Short BR, Vargas MA, Thomas JC, O’Hanlon S, Enright MC (2006) In vitro Activity of a Novel Compound, the Metal Ion Chelating Agent AQ+, against Clinical Isolates of Staphylococcus aureus. J Antimicrob Chemother. 57(1):104-9.